It takes a surprisingly long while for Feisty Girl to find a home, but then again, maybe not so long, considering the requirements: cat-free, other-dog-free, child-free. My house is none of these things, and so for two months, the cats hide in my bedroom, looking glum, while the Red Dog moves from his usual spot next to my desk and into the hallway, looking glum as the Feisty Girl nestles against my feet. She is so untamed that I cannot walk them together, so I don’t walk them at all. I separate the dogs at night – Red Dog with me, Feisty Girl with The Child – and each morning wake up to the sound of loud crashing, as Feisty Girl hurls herself against The Child’s bedroom doorknob in an attempt to liberate herself as the sun comes up. I’m tired and cranky and more than a little glum myself. The house spins out of control quickly: with two dogs and no cleaning lady, and army of dust bunnies begins to form, and, I must assume, plan a military coup to depose me. I begin to call and gently nudge the Rescue Rep, who starts to send potential adopters: a woman who wants to keep Feisty Girl in the garage all day, and then have her hang out on the sofa with two cats each night; a farmer with lots of children and another dog roaming his large, unfenced property. She doesn’t seem to grasp what I am telling her about the Feisty Girl, and gets testy and defensive when I question the screening, tactfully at first, but then less so as time passes and I realize how much it matters not just to Feisty Girl but to me, that she finds not just any home, but the right home. I spend my free time reaching out to other rescuers, creating promotional flyers that we post on Facebook and the Rescue’s website. I nudge and cajole, and hope and pray that the right person will come along, as my kitchen devolves into something resembling a college fraternity after a party. In the midst of it all, The Child falls in love with this Feisty Girl, and tries to come up with ways that maybe, somehow, we can keep this sweet dog that shares her pillow at night. The only dog that ever liked me more than you, she says. Finally, an email arrives, from a man who just lost his own dog in a divorce – he has no other pets, just a teenage daughter who runs track and needs a running companion, while Dad is hoping for a dog he can train to do agility, who will keep him company in his office during the day. They come to meet her, and fall as much in love with the Feisty Girl and she does with them, and even The Child concedes: I don’t mind her being adopted if she can go live with nice people like that. We’re a little surprised to discover they live – temporarily, while a new home is being renovated – on a boat, but pleased when they invite us to visit the Feisty Girl and take a boat ride one day during the summer. It is all perfect, until the moment comes to say goodbye, and hand the leash over, and The Child weeps quietly, hiding behind her long hair, as she does what she knows she must. You will not be surprised to hear that I didn’t cook much while this all was going on – I guess, technically, pouring hot water over Cup-O-Noodles is cooking, but let’s not kid ourselves about what is and isn’t real food. One evening, though, when the kitchen was briefly clean enough to use, I made us a quick and easy treat: caramel corn. I found this recipe when I googled Karen DeMasco, who also created the recipe for Granola Jam Bars, which I’ve made several times now and still adore. It has all the winning qualities of the jam bars, too: The ingredients are all things that are sitting in the average pantry, and there is nothing overly complex about the process. The resulting caramel corn is delightfully sweet, but with a fiery kick that sneaks up on you as you munch away. The combination is strangely addictive, and certainly unique – but if it isn’t your thing, just omit the cayenne and have some delicious caramel corn. Or toss in some nuts. Or whatever makes you happy, on one of those days that you need something special. Spray two large heatproof rubber spatulas and a very large bowl (at least twice the volume of the popped popcorn) with nonstick cooking spray, or lightly wipe with vegetable oil. Heat the oil in an 8-quart or larger heavy-based stockpot over high heat. After a minute, put a popcorn kernel in the pot and cover. When the kernel pops, the oil is hot enough. Add the rest of the popcorn kernels. Cover the pot and shake it back and forth over the heat to agitate the kernels. Keep moving the pot as the popcorn pops. Remove the pot from the heat when the popping slows almost to a stop (it’s better to have a few unpopped kernels than burnt popcorn) and immediately pour the popped corn into the large metal bowl. Removing any unpopped kernels or burnt pieces. Measure the baking soda and cayenne into a small dish and whisk together so it’s ready to go. Line two rimmed baking sheets with parchment, foil, or nonstick silicone mats. In a 4-quart or larger saucepan, combine the sugar, salt, butter, and 1 cup water. Gently stir just enough to immerse the sugar. Brush down the sides of the pot with water and a clean pastry brush. Cook the sugar mixture over high heat without stirring until it melts and bubbles and turns a very light golden caramel color on top; this will take 10 to 20 minutes, depending on your stove. The caramel will be darker than it appears on the surface, so don’t overcook. At this point, remove the pot from the heat. Working quickly off the heat, thoroughly whisk the baking soda into the caramel. Do this in or near the sink in case it spills over. The baking soda aerates the caramel, which makes it easier to eat when it’s cool, but causes it to bubble vigorously now, so be careful. 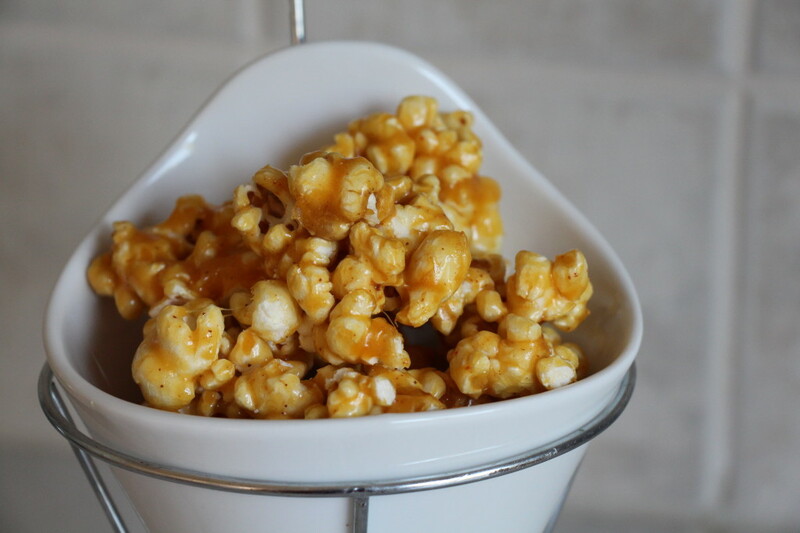 Immediately pour the bubbling caramel over the popcorn in the bowl. Only use the caramel that pours out easily; don’t scrape the sides of the pot (the sugar on the sides of the pot crystallizes easily and can cause the caramel to do the same). Using the spatulas, toss the caramel with the popcorn. When the popcorn is thoroughly coated, pour it onto the lined baking sheets and use the spatulas to pat it into one flat layer. As soon as it’s cool enough to touch, use your hands to break the layer into smaller clusters. Let them cool completely and then store in an airtight container for up to a week. If you don't want spicy caramel, omit the cayenne. If you like nuts, toss in 2 cups of your favorite before adding the caramel. Wow That caramel corn looks so good.